Fine. Fast shipping and order satisfaction guaranteed. A portion of your purchase benefits charities and literacy groups! New. Sewn binding. Cloth over boards. 456 p. In Stock. 100% Money Back Guarantee. Brand New, Perfect Condition, allow 4-14 business days for standard shipping. To Alaska, Hawaii, U.S. protectorate, P.O. box, and APO/FPO addresses allow 4-28 business days for Standard shipping. No expedited shipping. All orders placed with expedited shipping will be cancelled. Over 3, 000, 000 happy customers. Fine. Sewn binding. Cloth over boards. 456 p. In Stock. 100% Money Back Guarantee. Brand New, Perfect Condition, allow 4-14 business days for standard shipping. To Alaska, Hawaii, U.S. protectorate, P.O. box, and APO/FPO addresses allow 4-28 business days for Standard shipping. No expedited shipping. All orders placed with expedited shipping will be cancelled. Over 3, 000, 000 happy customers. New. 0133489795 BRAND NEW W/FAST SHIPPING! 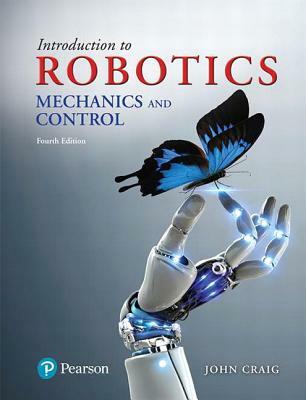 This item is: Introduction to Robotics: Mechanics and Control, 4th Ed., 2018, by Craig, John J.; FORMAT: Hardcover; ISBN: 9780133489798. Choose Expedited for fastest shipping! Our 98%+ rating proves our commitment! We cannot ship to PO Boxes/APO address. To avoid ordering the wrong item, please check your item's ISBN number! Excellent. [ No Hassle 30 Day Returns ] [ Edition: fourth ] Publisher: Pearson Pub Date: 3/5/2017 Binding: Hardcover Pages: 448. New. Orders are normally processed within two business days, and shipping time normally can take anywhere from 5-7 days but can take up to 14 days depending on delivery location. PLEASE NOTE: We do not ship on weekends (FRIDAY-SUNDAY) or any national holidays.